There are few times when golfers and anti-poaching teams might join forces to protect wildlife—this was one of those times. VFAPU’s 17 scouts, who tackle all forms of poaching in the Victoria Falls region, have arrested nearly 700 poachers since the unit was established in 1999. VFAPU was established by Charles Brightman, a local safari operator and conservationist, and Victoria Falls Safari Lodge. The unit, which works closely with the Zimbabwe Parks and Wildlife Management Authority and the Zimbabwe Republic Police, has also removed more than 22 000 wire snares from its operational area, and rescued 183 injured mammals from snares. “It was a fantastic effort, and I’d like to thank everyone involved. It is tremendous to see so much support for such an important cause,” said Charles Brightman, VFAPU head of operations. 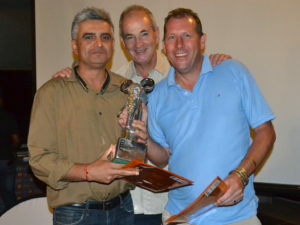 Sanjay Babbar and Tom Austin won the tournament, with other teams including the Zimbabwe Special Olympics golfers sponsored by Delta Airlines, and Ambrose African Birds, who took the best dressed team prize in matching wildlife inspired outfits. The tournament winners each took home a voucher for two nights in a three-bedroom Safari Suite at Victoria Falls Safari Suites, valued at $2,400, while second and third prize winners each took home accommodation vouchers for two nights, including breakfast, at Victoria Falls Safari Club and Victoria Falls Safari Lodge respectively. 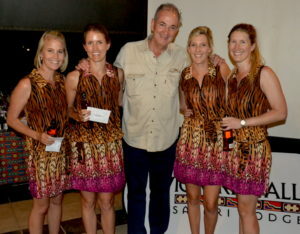 After the tournament, a Patrick Mavros bracelet and four travel packages were auctioned, including a 12 night self-drive holiday for two people around Zimbabwe staying at Chilo Gorge Safari Lodge, Camp Amalinda, Somalisa Camp, Victoria Falls Safari Lodge, Ilala Lodge and The Hide Safari Camp, which fetched $4,600. In addition to the funds raised at the golf day, goods such as 17 two-plate gas stoves and cylinders, and engine oil, were also donated. Africa Albida Tourism (AAT) chief executive Ross Kennedy was very happy with the results on the day. “Once again the spirit and commitment of Zimbabweans was on show,” he said. “In this challenging economic environment with so many demands on business and community, we are overwhelmed by this show of care, concern and shared commitment to anti-poaching and conservation,” Mr Kennedy said. “The sense of genuine compassion and humanity for those challenges is truly valued by us all,” he said.